RSP is really needed but also its needed some mechanism to let people know about abusive server and how to avoid it. EA could do this, if it wanted. But instead, EA appears ready to enable cheaters and crybabies instead. 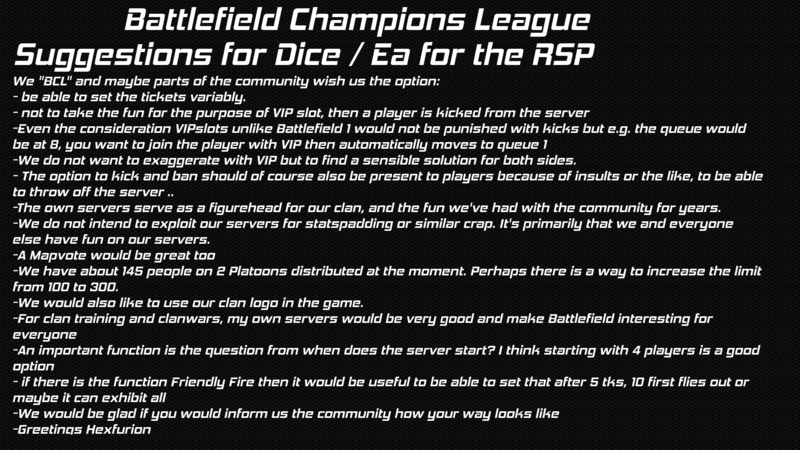 I really don't understand on how some people have so much hate for RSPs ... the simple solution is ..do not join rented servers if they are as toxic as some people believe , there's plenty of official DICE servers to choose from..so just move on..
On the plus side RSPs is a form of income for EA/DICE of which hopefully they'll put back into the game to improve it. Why would you not want another option? It's not like you're forced to go into a rented server....that type of logic baffles me. Indeed, I do not understand that either. RSP is needed and it's an VALID option for official servers, does not prevent people who wants to play in Officials playing there. As a server admin for FridayNightBattlefield I see the value in RSP and am eagerly awaiting the RSP implementation. That being said sadly there's been no update on RSP deployment from DICE at this time. RIP BFV. What a shame. in BF4,I enjoyed playing KD<1 server. composed of noobs but funny. DICE has no ability to manage fair playing depending on player's SKILL. so we need. it is small things what you said. Thats why i m not buying BF5 until there is info on RSP. Same goes to my clan-m8's. people asking for modding SDK's etc. custom to not get populated. longer than the next release of a successor. everydays work as an admin a FULLTIME JOB. (plus the specific server settings). i started developing my own game because of being tired of such ... ehm... [set the word of your likes]. Hello! Long time BF Player. And we really want our own place to meet and play together, I KNOW alot of your community thinks the same! We are a growing community with alot of great players, but nowhere to meet as we gather around our campfire! The "SquadPlay" They promised was gonna be so good is not here yet... They even removed one Squad slot, now we have 4/4. Witch means for me alot less focus on playing together! And not even talking about the system they have now to join your friend if they have a full squad, pretty unessesary to ask for the server ID when they are in full combat. I just wish you all can help us out here in this post! Contact "Hexfurion" and help us gather more people in one place so we can get more attention for this Request! SRP was in BETA since bf1 launched in late 2016, and was still in BETA before I quit bf1 in spring 2018, so get the point? I believe this is EA’s intent. By disallowing adminned servers, cheaters, racists, and obnoxious players will ruin the game for most players, thereby shortening the lifespan of BF V.
EA seems to think that rental servers will ruin sales of the next installment, although I believe that legacy rental servers help to continue the sales of older titles. Everybody and I mean everybody needs to stop buying Battlefield games before they are six months old. What's next, only one kit in the new game, with the rest 'promised soon' or some ridiculous cash in garbage like that? We are a while off now but I am sure not going to forget the insults and lack of content for my $120. When were rented server ever a problem? Just don't go on them, stick to official servers. By your blatant trolling I can see why you were banned from private servers. RSP is a must for players who plays comp. Need to have private servers and setup matches. I would like to have rented servers for own map rotations too, some maps really sux. Use logic. RSP will only come when they've decided they can't make any more money off the game. Having large concurrent user's and monthly active users on their servers looks good for the investors and encourages you to spend cash on MTX's. Why would they want you on servers where they can't control the experience to essentially force you to buy something? Why would they want you on servers which might decide to deactivate custom skins, again disincentivizing MTXs? well, besides doubting that they would offer this as a setting i m pretty sure its in their hands not to allow this serverside setting anyway. this doesnt explain at all why there are no servers for rent. its even contradictionary as communities are a reason for MORE playing and MORE potential mtx.